This is a photo of the Vitcoria Memorial, created by sculptor Sir Thomas Brock in 1911 and erected in front of the main gates at Buckingham Palace in London on a surround constructed by architect Sir Aston Webb. It is made of 2,300 tons of white marble. It has a large statue of Queen Victoria facing north-eastwards towards The Mall. 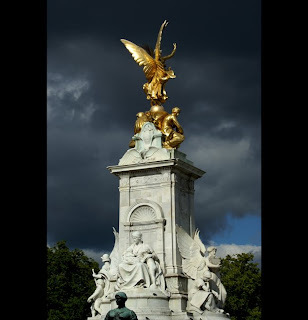 The other sides of the monument feature dark patinated bronze statues of the Angel of Justice (facing north-westwards toward Green Park), the Angel of Truth (facing south-eastwards) and Charity facing Buckingham Palace. On the pinnacle, is Victory with two seated figures. 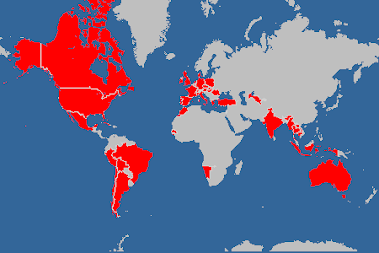 The subsidiary figures were gifted by the people of New Zealand. The whole sculpture has a nautical theme, much like the rest of the mall (Admiralty Arch etc...). This can be seen in the mermaid, mermen and a hippogriff, all of which are suggestive of Great Britain's naval power.